Second in the “Bone Island” Trilogy, “Ghost Night” brings us another mystery, another set of murders with the Becketts of Key West, along with my personal favorite character of the series, Bartholomew the Ghostly Privateer (as he’s always correcting others “I’m not a pirate…”). 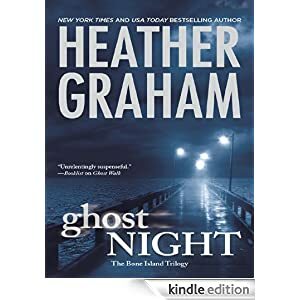 What I like about this series, apart from the brush with the paranormal, is the author’s use of history to further cement the believability of the characters and area of the state of Florida. Key West is a real city in a real state, although the Becketts and Bartholomew may be fictional. We get a mystery on our hands when budding filmmakers slasher movie comes to life. One of the survivors hands our Becketts slop on a shingle and expects them to create a souffle. There isn’t a dull moment in any part of the story (or the trilogy, the final book will be reviewed next Monday). The characters are still true to themselves and the storylines and Heather Graham is good at what she does.